Years and years ago, when Thomas was so very little, less than 6 months, but after I went back to work, he went through a fussy period each night. His siblings later went through the same period. It was the, “Thank God mom is finally home, I can go ahead and tell her how much I missed her” hour. Not colic. Not even close. But still infant misery hour. Recently I substituted “Princess Bear” in for “Baby Bear” when Sambam gave me the “I ain’t no baby!” look. Speaking of Princesses, Sambam has her own royal throne now. She isn’t fully ready, but she is so very close. Close enough for the purchase so she can get comfortable with it being something known. I’ll show her later how to use it. Then in a couple of months I’ll gently start encouraging its use. Then in September I’ll actively try to enforce its use. If she doesn’t beat me to it. She is rather excited about it being in the house. 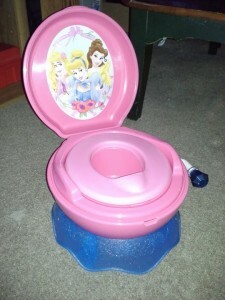 She also has a padded seat that goes over the big potty. Should she prefer. After all, I true princess gets their choice of thrones.